Intense Results is yet one more application in the notorious SuperWeb family. Other adware programs such as Package Return, Number Ascend, Primary Color, and quite a few others are also known to be developed by this infamous group. Thus, it is not surprising that Intense Results must be removed as soon as possible, just like all of its counterparts. Keep in mind that all the statements on the official Intense Results website are a hoax, as it will not improve your web browsing experience in any way. In fact, this intrusive adware program will only do the opposite. In order to regain the standard functionality of your web browser, you will need to conduct a thorough removal of Intense Results. Use the removal guide provided below, as it will help you delete this worthless adware in a quick and easy manner. Once this invasive adware program enters your operating system, your browser will instantly be flooded with various third-party commercial ads and annoying pop-ups. This is the standard way that adware programs of the SuperWeb family function. It goes without saying that this activity will make your life miserable, as you will have to fight through numerous unwanted ads and pop-ups every single time you browse the web. You must know that all the ads and pop-ups provided by Intense Results are utterly useless and will in no way help you save money or time while shopping online. Knowing that this adware holds no beneficial features whatsoever, it is quite natural that we strongly advise you to remove Intense Results as soon as it is detected running on your PC. In order to protect your PC from malicious programs similar to Intense Results, you need to take a few preventative steps. It is imperative that you download your software from official vendors’ websites. This is important, as third-party download websites often provide installers filled with various unknown applications. Such websites must be avoided at all times. In addition to practicing safe browsing habits, you must have a reliable antimalware tool, which would provide overall system security at all times. Fortunately, the removal procedure for Intense Results is rather simple, as you can remove this intrusive adware program via Control Panel. In order to make sure that every bit of Intense Results has been removed you need to conduct an in-depth analysis of your PC for potential leftovers. 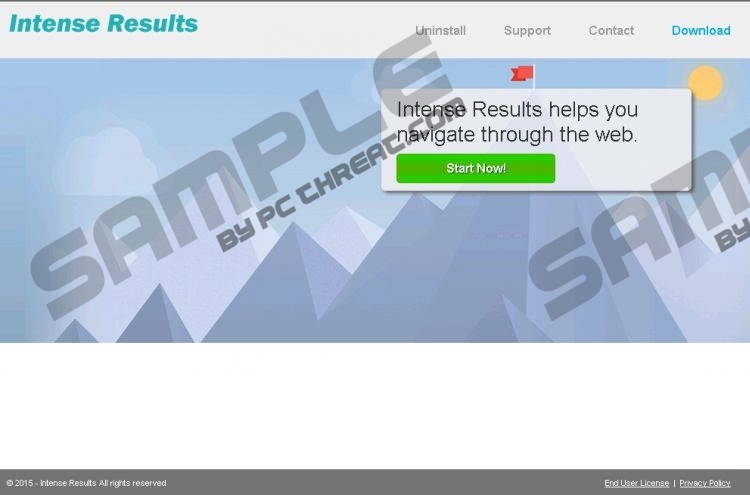 It is crucial to remove Intense Results completely, as just a few leftover files or registry entries could be used to restore this intrusive adware program. Select Intense Results and then click Uninstall. Select Intense Results and click the Uninstall button. Quick & tested solution for Intense Results removal.